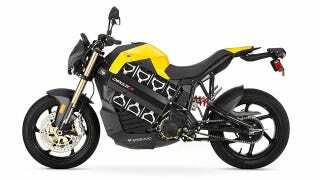 It's been less than a month since Polaris acquired electric motorcycle manufacturer Brammo, and the first fruits of that partnership may have been revealed in a trademark filing for the Victory Charger. The trademark, filed on January 27, is owned by Polaris Industries and titled "Victory Charger", with the description reading "Electric motorcycles and structural parts therefor". Victory was created by Polaris back in 1997 as a competitor to Harley-Davidson, which is rumored to be putting its LiveWire electric motorcycle into production this year. Now that Polaris has Brammo's sweet IP to work with, an electric bike from one of Polaris' many brands is practically a given, but whether it will be a reengineered version of an existing bike or an all-new Victory is up the air – based on Victory's current lineup, we'd guess the latter.